Take the quiz. Those with the correct answer will be entered to win our monthly giveaway. February: Name the event that takes place in The Last Green Valley during the month of February in Willimantic, CT, featuring “Cupid Made Me Do It: Urban Scramble” and the “Let Them Eat Cake! Baking Competition!” Answer: Romantic Willimantic’s Chocolate Festival. Winner: Rita B. from Coventry, CT.
January: What is the name of the survey that The Last Green Valley does on a Saturday morning in mid-January each year? Answer: Mid-winter Eagle Survey or Eagle Survey. Winner: Don R.
December: What was the name of a Governor of Norwich from 1770 – 1772, buried in the Old Norwichtown Burial Ground, who was also a servant to Governor Samuel Huntington? Answer: Boston Trowtrow. Winner: No one answered correctly. November: What is the name of the family that started Old Sturbridge Village? Answer: The Wells Family (Albert & Cheney). Winner: Lori S. from Rhode Island. October: What is the name of “the sophisticated probe” that water quality volunteers in The Last Green Valley use to measure water characteristics such as dissolved oxygen, pH, temperature, turbidity, and conductivity. Answer: a Troll. Winner: Beth C. from Norwich. September: Walktober will be starting soon. In what year did it begin? Answer: 1991. Winner: No one answered correctly. August: Often seen basking in the sun on rocks or logs, this type of turtle sheds its outer layer of shell in mid to late summer, revealing a brightly colored shell underneath. What is it? Answer: Painted turtle. Winner: T. Adams from Minnesota! July: In what town in The Last Green Valley do the Quinebaug and Shetucket Rivers converge? Answer: Norwich. Winner: John M. from Putnam. 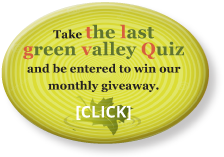 June: Which town in Last Green Valley has more operating dairy farms than any other town in CT? Answer: Woodstock. Winner: Thomas S. from the Griswold/Lisbon/Voluntown area. May: Who was the first Red Sox player to be named American League Rookie of the Year? Answer: Walter Dropo. Winner: Cheryl G., West Hartford. April: What is the name of the program in which the TLGV School Outreach Coordinator goes into a classroom of middle school children to teach them about water pollution? Answer: Watershed Education or Enviroscape Program. Winner: No one answered correctly. March: What famous person from The Last Green Valley that was quoted to say, “I regret that I have but one life to lose for my country.” Answer: Nathan Hale. Winner: Cheri R. from Hampton, CT.